We all love to watch TV, whether it is sports, reality TV or high drama and now watching TV on an android device is possible. Watching TV on an ipad or iphone has been available for a while and now support for Android devices is also available. 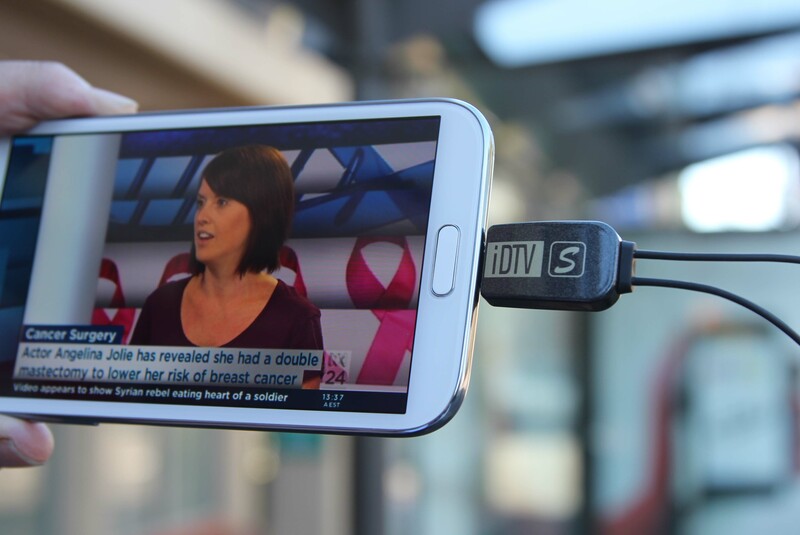 The iDTV S for Android devices works much the same as for the ipad and iphone version but with the micro USB port connector, and like the iOS version there is no streaming of TV over a mobile network, no internet connection, no wifi connection required and most importantly no data usage on your mobile plan. Unlike other mobile TV products, this has a very simple set up. Download the free Android APP which supports the iDTV S and provides an easy to use interface for watching, scrolling thru channels and recording your favourite shows all whilst on the go. Once connected users can tune into Standard definition Australian TV channels which is done automatically when the app is first launched. Of course like any Free to Air TV, users must be in a good DVB-T reception area. We tested a number of Android Handsets, Samsung S3 and S4 and Note 2 and received great coverage outdoors. The iDTV S also works on HTC One X , Plus and the Sony Xperia viewing was outstanding. Some of the Android tablets as are great to use the Idtv S with, of course check the specs to see if your device is compatible.